HMD Global continued its growth on the mobile market during 2018 with Nokia-branded phones. According to a report from Counterpoint, that we already covered here, HMD shipped 17.5 million Nokia smartphones in 2018, growing 126% compared to 2017. Something worrying I found in that report is HMD’s Q4 results, that were better than in Q4 2017, but worse than in the previous quarter (Q3 2018), which is strange because Q4 is traditionally the best quarter for consumer electronics. An explanation for that result could be found in a new Canalys report. 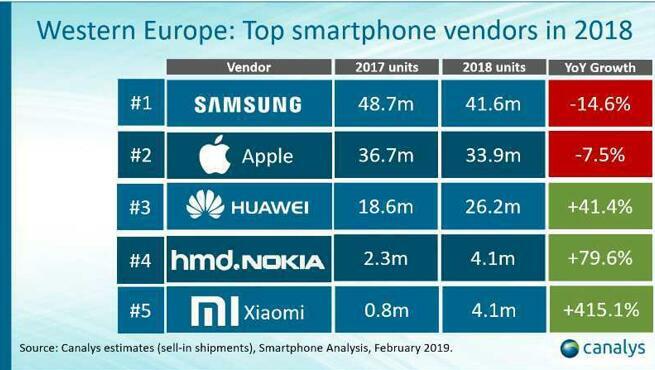 According to Canalys, Nokia was the No.4 smartphone brand in Western Europe with 4.1 million units sold during 2018, with a growth of 80% compared to 2017. Right behind HMD is Xiaomi with the same number of units, and on No.3 Huawei is far away with 26.2 million units. Things get bad in Europe when we look at the regional results for Q4 2018. The results also come from Canalys, but it’s in low resolution. Still, one can clearly see a 43% decline of sales in Q4 2018 in Central and Eastern Europe compared to Q4 2017; and a 5% decline in Western Europe during the same time period. 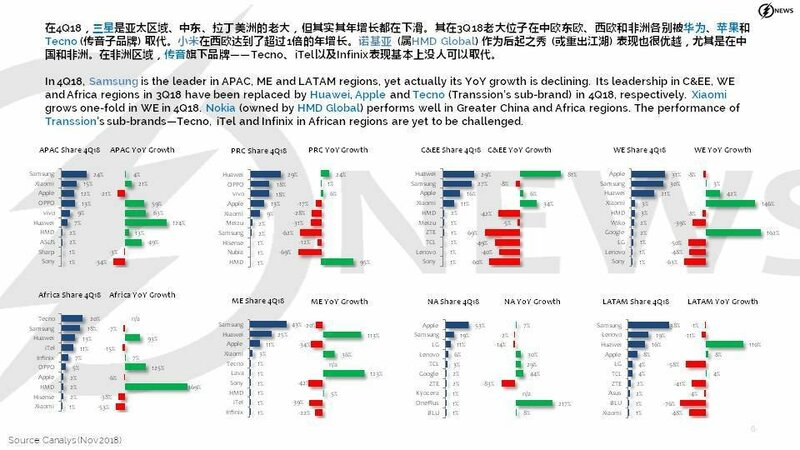 In other regions were HMD was in the top 10 (APAC, China, Middle East and Africa), the company posted growth year-on-year, from 5% to 169%, which is impressive. So what happened in Q4 2018, when HMD shipped 4.6 million smartphones compared to 4.8 million in Q3 2018, according to Counterpoint Research, is the sales decline in Western, and especially Central&Eastern Europe that negatively impacted the total sales for the quarter. It’s not surprisingly considering that the only new device in Q3 and Q4 in Europe was basically the Nokia 7.1, while Nokia 5.1 Plus popped somewhere up and phones like Nokia 6.1 Plus or 8.1 weren’t available. If Nokia 5.1 Plus, 6.1 Plus, 3.1 Plus and Nokia 8.1 were all released in Q4 in Europe (as they all were available in China and other Asian countries), the results would’ve been better. As we learned, HMD initially planned to release the Nokia 8.1 and Nokia 9 PureView in Europe before the end of 2018, but as everyone knows, that didn’t happen. I don’t want to sound as an alarmist, but I’m just pointing out that a strong market for HMD, where they are among top 5 smartphone vendors, experienced a significant drop in sales during Q4. In other markets HMD performed well, but in my opinion, the company needs Europe to succeed.